Or maybe down deep it's the reason all pastors become pastors (besides a call from God of course). The children. Oh, the children! The children! Their willingness to ask questions about God. Their curiosity. Their love. Their hands open to receive God's gift of bread and wine. Their laughter and tears. The children who draw pictures of what God looks like and pictures of the pastor. The children who know that church is a safe place. The children who are not afraid to come forward in church and know that they are valued and loved. For a while we didn't hear too many children in worship. When we offered silence for prayers, we had silence. When we took time to reflect on our sins, silence. When the sermon was preached, silence. These days we no longer have silence during the prayers or during the sermon. We hear the laughter and cries of children who are just coming to know their own voices, who are eager to share with the world. We hear the echo of "Amens" and "Alleluias!" We hear questions about whether they can go to the nursery or visit with their friends. We hear about snack time. We have visitors up and down the aisles. We have children. We have life. I look out at the congregation each and every Sunday and I give thanks. I offer God's words of grace and love and know that the children, too, offer their voices in worship, offer words of God's grace and love. You see, pastors need children in worship to remind them over and over again that this worship thing isn't about us. Ever. It's not about me. It's about God. It's about the Gospel. The good news of Jesus Christ who lived, died and rose for us. Each of us. It's about community. All of us. Each and every one of us. It's about blessing. One of our spunky two-year-olds taught me a lesson about blessing. This red-headed two-year-old comes to the communion table with her hands covering her forehead. She knows I'm going to give her a blessing so she keeps her hands on her forehead. Each Sunday, week after week, blessings are given to the children and this two-year-old, without a doubt, would cry each week upon feeling the blessing. Slowly, though, the cries have abated, but the hands still come up. But I am not be deterred - blessing she will receive! A few weeks ago her mother sent me an email and shared that even though her daughter refuses the blessing at church she appears to know its meaning and value since at home she places her hands on her mother and says, "Bless." Even at two years old, even with placing her hands on her forehead to avoid the blessing, each and every Sunday, even then, she knows the power of a blessing. She knows that it's not about her. She shows us that ultimately God blesses us despite our best efforts to keep the blessing away. We can't get away from God's blessings. We can't miss the blessings of God. They are all around us - from the youngest to the oldest and everyone in between. So next time you hear the delighted sound of a child, remember how blessed we are to be in community. Together. Blessed. May and August are special times in the life of the seminary. For Trinity Lutheran Seminary students, transitions are a part of life in community. Come every May and August you'll find moving vans, trucks, cars packed-to-the brim and excitement in the air for the upcoming year. In August some students are new to the community and wondering what this seminary-thing is all about. Others are returning from a summer serving as a hospital chaplain or a year-long internship. And some have remained in the community. Nevertheless, newness and hope run rampant. And lots of moving. Lots of boxes. And those darn three-flights of stairs. There's something in the air come August that signals to people - "Come and help move boxes!" With the sight of a moving truck, people come. Returning students and their families know what it is to move, over and over again. Returning students know what it is to have the load lightened. Returning students know that beer and pizza often come after hours of moving boxes. The seminary community knows how to welcome. I remember conversations with new students; many didn't even remember the names of those who had come to lend a hand. It was all just too much. But people were there to make the transition a bit easier. 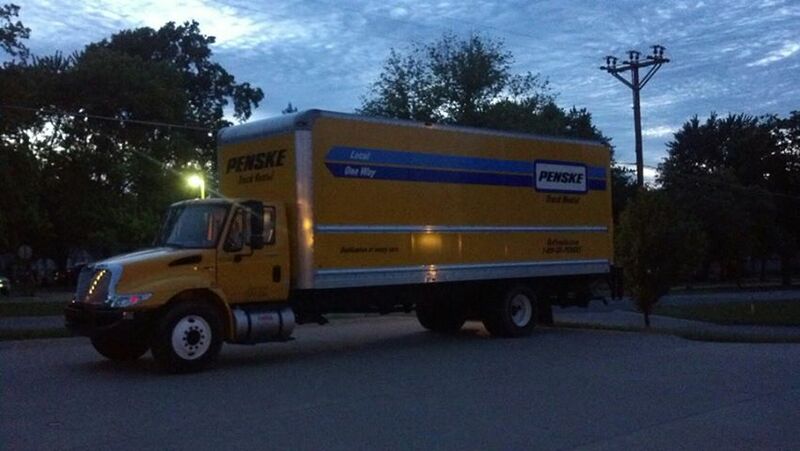 My friend, Derek, always seemed to have a sixth sense of just when someone would need help moving. I think he helped move every seminarian and their families one year. It's just what you do in community. Moving in the summer in Ohio may not be at the top of any one's list. But with many hands and water and laughter, the job gets done. And community is built. One box at a time. That's why this past May graduation weekend at Trinity and with the moving of my husband to Missouri, I knew we were in good company. I had witnessed countless moves, helped countless students, moved myself, and now finally, was moving my husband. In the same way that a community knows how to welcome, they know how to say goodbye - one box at a time. Step-by-step. Lots of laughter. And lots of pizza and beer. The appointed time came for the loading of Stephen's boxes and furniture. One by one our friends came. Their spouses and their children too. Another lesson in community - everyone has a place. Even three-year-old Conner wanted to make sure he could carry Mr. Stephen's things, "What can I carry?" In less time than it would have taken just Stephen and I we had the truck packed. Box by box. Step by step. Community at its finest. I think of all the people who come to the seminary and all the people who leave. And all their boxes. All the hands that carry and lighten the load. 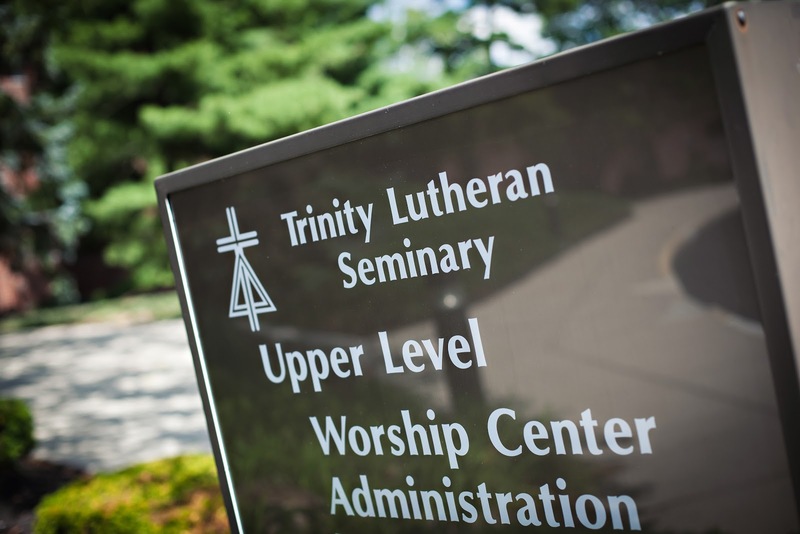 Trinity's mission statement says that the seminary forms leaders for Christ's church at work in the world. I, for one, know that there are church leaders scattered throughout the US and the world who are serving God's people - one step at a time, lightening the load for others, and sharing lots of laughs. I learned lots of helpful and insightful lessons in seminary, and even some not-so-helpful things, but perhaps most importantly, that which will carry me through ministry and transitions, blessings and challenges, will be the gift of moving and carrying boxes for others. Knowing how to welcome and how to say goodbye. You're going to be a pastor. Your step-dad and father will die before you turn 30. You're going to serve in The Gambia, West Africa for 2 years. Where in the world is The Gambia? You'll be called to be a pastor in Missouri. You'll fall in love and marry another pastor. A clergy couple? No way! You'll be engaged in a long-distance relationship and marriage for over 2 years. You've got to be kidding me. Married couples live together. Yet, here I am. Living in Missouri, a pastor, married, and now anxiously awaiting the day when 2 years and 4 months of a long-distance relationship comes to an end. My husband, Stephen, graduates from seminary this Saturday. Three years ago I took my turn robed in cap and gown walking along Main Street with cars honking and family cheering. Now it's Stephen's turn. Graduation is exciting and hopeful. But so is living together. So is being married in the same state. Once Stephen graduates we're packing up and starting our life together. Nine months after our wedding day. Now granted we have seen each other, and we've talked on the phone every day but 2 during these two years. But we've missed out on the day-to-day living. Until now. We did it. Thanks to God. Thanks to family and friends and time at the farmers' market. Thanks to skype. I'm no expert on relationships but these last two years have provided time for reflection on what's worked for Stephen and I over the distance. It hasn't been always easy or fun or loving. There have been many tears. And frustrations. And silence. But also lots of laughs. And wonderful hugs upon first seeing each other after some time away. We learned the important of date nights across the distance. Date nights over skype eating dinner together and recapping our days. Date nights going for a walk with phone in hand. Date nights watching Modern Family together (of course only taking during the commercials!) What was important was that we set aside time for each other. Together. We remembered the joy in receiving snail mail. We poured our feelings and love and frustrations on pen and paper. We saw glimpses of places visited and people met through postcards and pictures. We took the time to mull over our words and see our writing. I love talking with the older members in the congregation I serve and their stories of letters collected and saved from years of separated relationships due to military service. Stephen and I too now have a history of the early years of our relationship. We continually gave thanks for family and friends. Whether it was a late night tearful call to my mom or the middle of the day calls from friends to say hello, we were loved. And never alone. We move forward together, Stephen and I, strengthened and hopeful. And thankful for the unexpected encounters and experiences to come. It's not every Sunday that one gets to worship with the bishop of the synod and a previous pastor of the congregation one is currently serving. The morning was spent celebrating God's Spirit moving in the life of the former pastor, Ken. He's been ordained for 45 years. A perfect morning to reflect on call. God's call and claim in our lives. The mark of the cross on each of us. The name beloved spoken to our hearts. One member asked if I was nervous with the bishop and former pastor visiting. Nope, I was just glad I didn't have to prepare a sermon. I was also especially glad to have the opportunity to reflect back on my own call and to look forward to the future of the church. When I was ordained just over two years ago, I remember the hands laid on me for a blessing. Hands of clergy who nurtured my call, taught, mentored, loved, and supported me over the years. Hands of clergy who know the weight and awe of this calling. Hand of clergy who've walked through the caverns of pain and doubt and through the meadows of hope and joy. Hands who've held a grieving family and a newborn. Hands who've offered bread and wine. Hands of clergy bruised and scarred and healed. Hands to love. This morning, I invited the children forward to lay their hands on Ken for a blessing. Hands of children full of possibility. Hands of children full of questions and wonder and awe. Hands of children reaching towards new life and new opportunities. Hands of children with crayon markings and scrapes and bruises. Hands open for bread and wine. Hands drenched in water. Hands to love. Yet, what about those who won't know the blessing of the hands placed upon them? What about my friends who are waiting and wondering if there is a place for them to serve God's people? What about my friends who've followed God's call and remain outside the welcome of a church because of who they have decided to love? My heart aches for them. My heart aches for the church who is slow to realize their gifts and call. I saw the hands of the children this morning and I saw hands welcoming all God's people. I saw hope for the future. For God's church. I saw the children and I saw future leaders who simply open their hands. Let's all open our hands, the beggars that we are as Martin Luther said, and open ourselves to God's grace. For all of us. The month of transitions. The month of parties and celebrations and barbecues. And not to mention lots of nerves and excitement. The month of hope. My husband Stephen graduates from seminary in just a few short weeks. We fell in love. We got married at the seminary. And now we're both almost alums. So in the midst of the transitions, the hope for our future together, and the gifts passed on through the years of learning, I find it fitting to write a love letter of sorts to the place that shaped me for leadership in the church. I remember our first meeting. You greeted me with your tree-lined, winding walkway. It was a summer day and I was scared. I was a sixteen year old walking towards three weeks away from my family. A sixteen year old filled with fear, worry, and excitment. I would be attending the Summer Seminary Sampler. Three weeks with other high schoolers and seminary counselors learning about God and vocation and serving the world. There I went up the walkway towards the beginning of our relationship. I would have been the first one to tell you that I would never go to seminary to be a pastor. Never. But I would go to seminary to be with other high schoolers, to take classes, to serve the Columbus community, and to learn from mentors. I would go to seminary to expand my definition of God and community. So, first of all, Trinity, thank you for opening your doors to a searching and thirsty high schooler in need of knowing that God loves me. Loves all of us. Thank you for showing me that faith and questions of God are meant to be discussed and laughed over and shared late-at-night in a dark chapel or over a picnic dinner. Thank you for sparking a fire within me. Following the Seminary Sampler program, Trinity continued to shape me in the relationships I developed with the professors and the campus pastor. Through college you kept in touch with me and reminded me that my gifts were valuable. You encouraged me to see the whole world as a place to share God's love. And when I decided that just maybe, maybe, seminary would be a place for me, you were there with a variety of programs and ways to be a leader in the church. You were there to welcome me and my specific gifts. Following college and Peace Corps service, I once again found myself meeting you with your tree-lined, winding walkway. Yet, then, at 24, I no longer was uncertain as to what I would find behind the entrance. Of course I had questions about theological education and my classmates and the classes and all the requirements that had to be done. But I also knew that I was walking towards a place of welcome and hope, and challenge. Thank you for introducing me to a wide variety of leaders in the church. For my classmates and colleagues. For the late nights singing together, for the early morning classes, for praying before each class, for the talent shows, and the daily worship, and wondering about how God could call such diverse people, for the endless readings and papers, for the chance to practice our prayer positions and presiding at weddings and funerals, for the cookouts and bonfires, and for all the children in the courtyard. Yes, thank you for the children in the courtyard. And that pogo stick. Yes, you know what I'm talking about. Those early mornings and those late nights and all the time in between bouncing on the pogo stick trying to get the most hops. If it wasn't for those children and that pogo stick I might not be as patient of a pastor as I am. If it wasn't for those children and that pogo stick I might not know what it is to play as a form of ministry. Thank you Trinity for all the frustrations that come from living in community. You know, all the miscommunication, all the hurt feelings, all the comparisons, and all those who think they know exactly how everything should be done. There was never a dull moment! Yet, when we gathered around the table for bread and wine, water and word, in our diversity we were gathered by a God, a triune God, who welcomed and continues to welcome each of us. Dirty, messy, hopeful, striving, searching, and beloved community. I wouldn't be where I am today if not for you, dear Trinity. Keep opening your doors. Keep welcoming. And keep believing in the God who walks with each us; who marks us with the sign of the cross; who forms and shapes us to be sent into the world bearing the love of redeeming and healing grace.